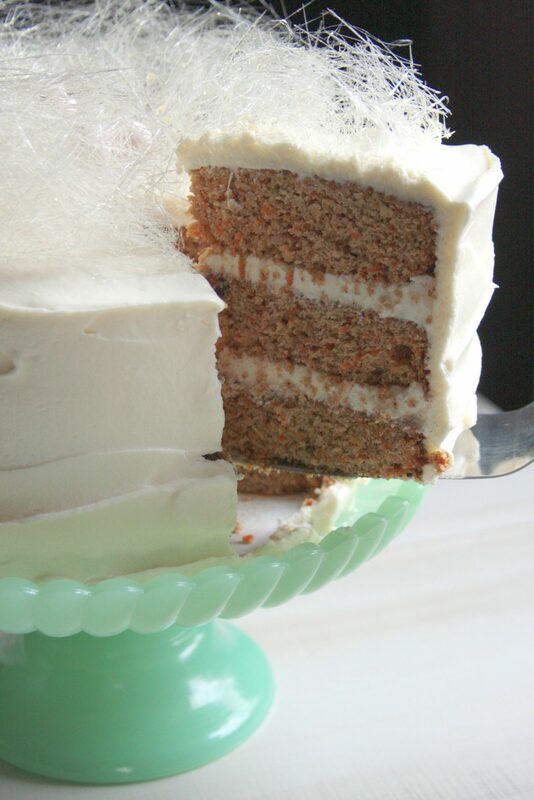 Carrot cake is one of my all-time favorite cakes. It probably has a lot to do with the frosting. Cream cheese frosting is one of the only instances where I’ll want more cake just so I can have more frosting. Most of the time I’d rather just eat the cake on its own but man, you put cream cheese frosting on a cake and watch out! For the longest time I had no desire whatsoever to even attempt making my own carrot cake. I really hate cutting up vegetables and the thought of having to finely grate a bunch of carrots was so unappealing I was ready to forever banish it from my recipe arsenal. We knew where to get the best carrot cake in town, and that was enough for me. Over time though, vegetables and I have come to an understanding and I have grown to not hating to chop them up as much. More importantly, I realized my food processor has a grater attachment on it. 😛 Now that Easter is just around the corner, home made carrot cake was calling my name. It took several attempts to get it just the way I like it, but this is my version of a perfect carrot cake recipe. I always find it funny how polarizing so many things in the baking world can be. Should a carrot cake recipe have raisins or not? Should it have pecans, walnuts or no nuts? Brown sugar vs. granulated sugar? How many carrots should be in the recipe? Should it have all sorts of spices or should it just stick with the standard vanilla extract? What about other mix-ins like pineapple, or coconut? So many things to consider! Should it have nuts? I tested it out with pecans and absolutely hated it, both because of the taste and the texture. The texture could have been altered by chopping them much smaller or even grinding them up but I did not enjoy the flavor they added to the cake anyway so there was no point in attempting that. I know I have had carrot cake with nuts in it before and enjoyed it but I really love this cake without. If you’re a die hard nut-in-your-carrot-cake fan, you can add 1/2 cup of finely chopped walnuts or pecans to the batter along with the carrots and raisins. Brown sugar vs. granulated sugar? I really thought I’d prefer the added depth of brown sugar but all it ended up doing was darkening the cake and giving it a molasses flavor. Not nice at all. I much prefer mostly granulated sugar with a smaller portion of brown sugar so you still get a bit of that depth of flavor but not so much that it overpowers the other flavors in the cake. How many carrots should be in the recipe? I’ve seen recipes that have as little as 2 cups worth of grated carrots, all the way up to a pound’s worth. The way I see it, it’s a carrot cake. It should be packed with carrots. I go for a full pound and don’t think twice about it. Spiced or standard? I always thought of carrot cakes as basically being a spiced cake with added carrots so I absolutely think it should have spices in it. There is a point, however, when the spices can get out of hand. I have this really great banana ginger bread recipe (I’ll have to post that on here sometime) that I absolutely adore. I LOVE ginger so this bread is right up my alley and is super moist. The first time I made this cake though, I kind of went over the stop with the spices and all I could think about what my banana ginger bread as I ate it. I wanted the spices in it but I didn’t want it to taste like ginger bread so I dialed back the ginger, nutmeg and cloves but kept the cinnamon and it was perfect. Mix-ins? This is similar to the spices situation. When you start adding things like pineapple and coconut, you’re crossing into Hummingbird Cake territory. Not to mention that adding pineapple makes it hard to not cross the line from moist to mushy. I do add a bit of unsweetened applesauce to kick the moisture up a level or two without going over the top, but that’s it. I could go crazy and add all sorts of things to it and I bet it would be delicious but it wouldn’t really be carrot cake anymore so I’ll save the add-ins for another crazy cake recipe down the road. Those are my thoughts on the hot carrot cake debate topics. ;P I ended up making this cake four times in 5 days. You’d think I’d be sick of it at this point but I feel like I could taste test cream cheese frosting every day for weeks on end and still love every bite. Give it a try! 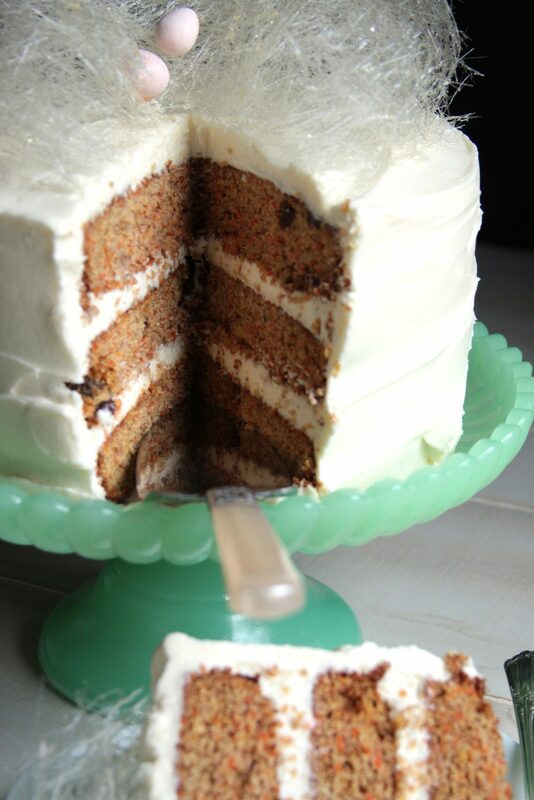 Perfectly moist carrot cake with the most amazing cream cheese frosting. Delicious any time of year but an added spun sugar nest with chocolate eggs make it the perfect Easter centerpiece. 336 grams coconut oil 1 1/2 cups, melted, can substitute vegetable oil. Place an 8 inch round cake pan on a sheet of parchment paper and use a pencil to draw an outline of the base. Cut out three of these circles and use them to line the bottoms of three 8 inch cake pans. No need to grease the sides or bottom. This will ensure the cakes do not stick to the pan. Just run a knife along the edge, flip the baked cake out and peel off the parchment. You can also substitute two 9 inch cake pans. Melt the coconut oil and let cool slightly. You don't want it warm enough to cook the eggs when you add them. Add the brown sugar and granulated sugar to the coconut oil in the bowl of a stand mixer. Mix until well combined. Add the eggs, one at a time, beating well after each addition until smooth. Add vanilla extract and applesauce and mix until well combined. In a separate bowl, whisk together flour, cinnamon, baking soda, baking powder, salt, nutmeg, cloves, ginger, and orange peel until well combined. Turn mixer on low speed and gradually add flour mixture to sugar mixture but stop mixer just before they are thoroughly combined. Add the grated carrots and raisins and fold them in by hand to complete mixing the batter. Divide batter evenly between the cake pans. Bake at 350 for 20-30 minutes depending on the size pan you used. A skewer stuck into the center of the cake should have a few moist, not wet, crumbs stuck to it. I used three 8 inch pans and they took about 25 minutes. Using two 9 inch pans would probably take 30-35 minutes because you'll have slightly thicker layers. I would not use three 9 inch pans because the layers would be much too thin. Cool the cakes in their pans for 10 minutes, then run a knife along the edge, flip them out and pull the parchment off. Finish cooling on a cooling rack. Wrap each layer individually with plastic wrap and refrigerate overnight. Add cream cheese and butter to the bowl of a stand mixer. Beat together until smooth. Add vanilla and powdered sugar. Start mixer on low so you don't coat your walls in sugar. Then turn the speed to high and beat until light and creamy. You can add a tablespoon or two of whole milk or heavy cream if the frosting seems too thick. I always use a cake turntable** to make icing the cake easier. Cut about 1/8 inch all the way around off of the edge of an 8 inch cardboard cake round so it doesn't stick out beyond the edge of the cake. Place the round on the cake stand. Place a dollop of frosting in the center of the board. Remove the cake layers from the refrigerator, unwrap them and place the first layer, upside down, in the center of the cardboard round. Use a piping bag with a 2A tip or an icing spatula to evenly coat the first layer of cake with about 1/2 inch of frosting. Add the next cake layer, upside down, checking from all sides that it is level. Add another layer of frosting. Add the last cake layer, again upside down, checking for level. Frost the top and sides of the cake with a crumb coat or very thin coat of frosting and refrigerate for 10-20 minutes to let the frosting firm up a bit. This will seal in all of the crumbs so they won't show through on the exterior of your cake. After the frosting has firmed up a bit, use the remaining frosting to frost the top and sides of the cake however you'd like. 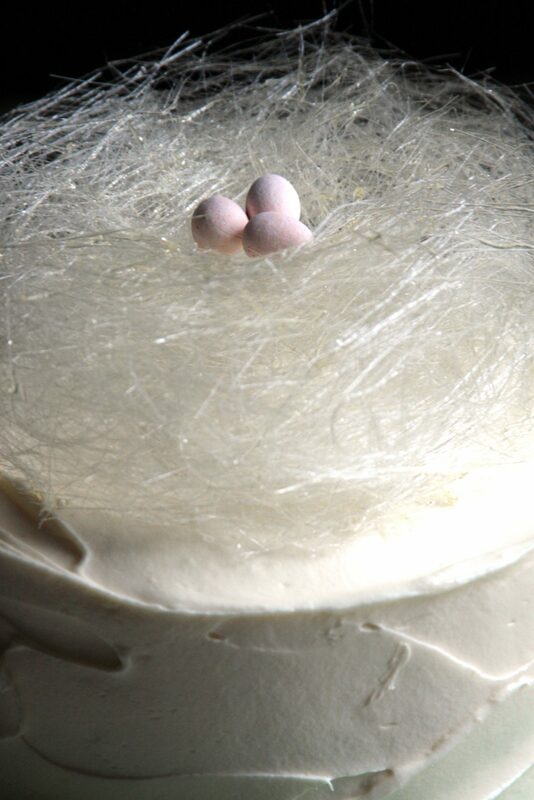 See the Recipe Notes section below for the link on how to make the Spun Sugar nest pictured on my cake. Cake is best if you allow it to come to room temperature for at least 3 hours before serving. See my Spun Sugar recipe for instructions on how to make the spun sugar nest topper. **This is the cake turntable I use. It makes frosting a cake and getting an even top and sides much easier and more enjoyable. 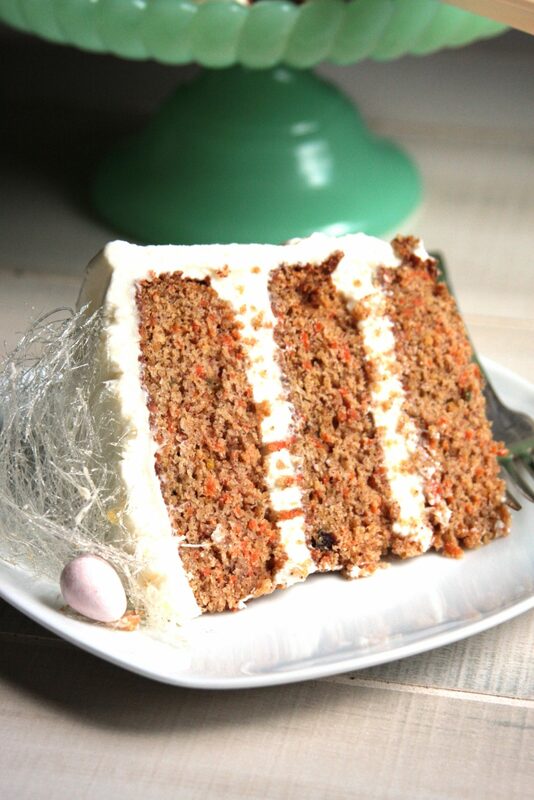 What are your carrot cake preferences? Raisins or no raisins? Spiced or carrot purist? Comment below! 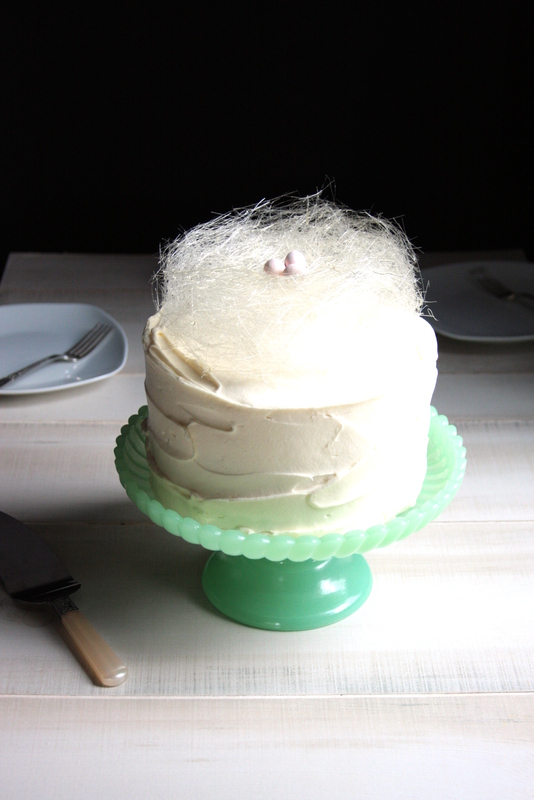 I can vouch for this cake — it’s fantastic! I’ve never tasted such a moist, delicious carrot cake before! The frosting was delicious and complemented the carrot cake perfectly. I went back for seconds, of course!